OK, so the first thing you're wondering about is that crazy contraption on my head! Not very attractive, is it?" "Hey, you should see it from the inside! Even worse! 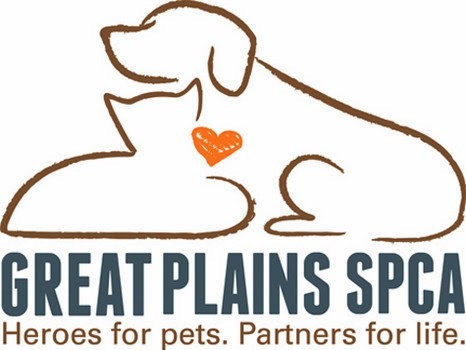 I can't really say exactly what happened before I got to Great Plains SPCA. I was in pretty bad shape though, very badly injured. Thank goodness the med team here is so awesome. They saved my life and put me all back together again! I'm almost healed now. And in a few more days, I'll even be getting rid of that crazy contraption on my head -whewwwww. Through it all, I've been a real trooper - everyone here says what a brave kitty I am and what a joyful spirit I have. Even when I was feeling my worst in the kitty hospital, being poked and prodded by strangers, I always showed everyone just how gentle and loving and grateful for their help I am. The bad times are behind me now and I'm feeling great! There's nothing but smooth sailing ahead. All I need is to find someone who will sail away with me through this wonderful life. Someone who will spend time with me and share all this love I have inside. Someone who will keep me safe so I never have to worry about being lost and hurt again. And someone who needs a very best friend as much as I do. Let's not wait any longer to find one another, okay? Please come down to Great Plains to meet me. I can't wait to begin our great new life together! Stop by and see this sweet guy today! We are so glad they could put you all back together, you are a sweetheart! Good luck to you sweet gentle Kitykins. We wish you the best. We hope you have a serene Sunday and go get yourself some big easy today. What a wonderful cat! It sounds like Kittykins has earned his way to a pawesome forever home. We hope his new family finds him soon. What a sweet kitty. I hope he gets a loving forever home very soon. Me and my mom-person sure hope that he will get a foreverhome real soon ! !